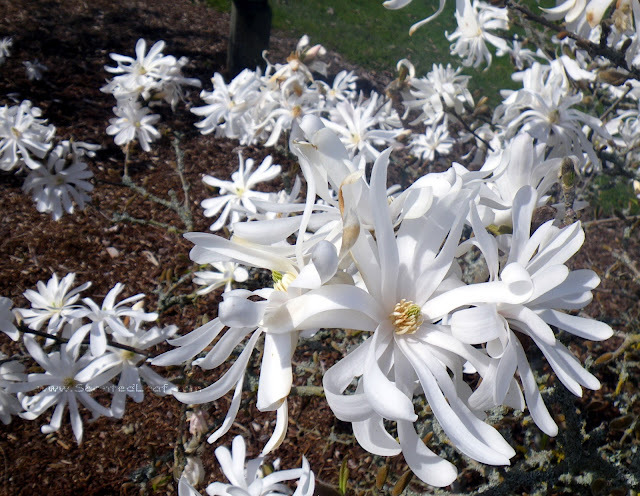 "Magnolia Stellata", aka Star Magnolia, flowers again freely, with masses of curliness flowers. 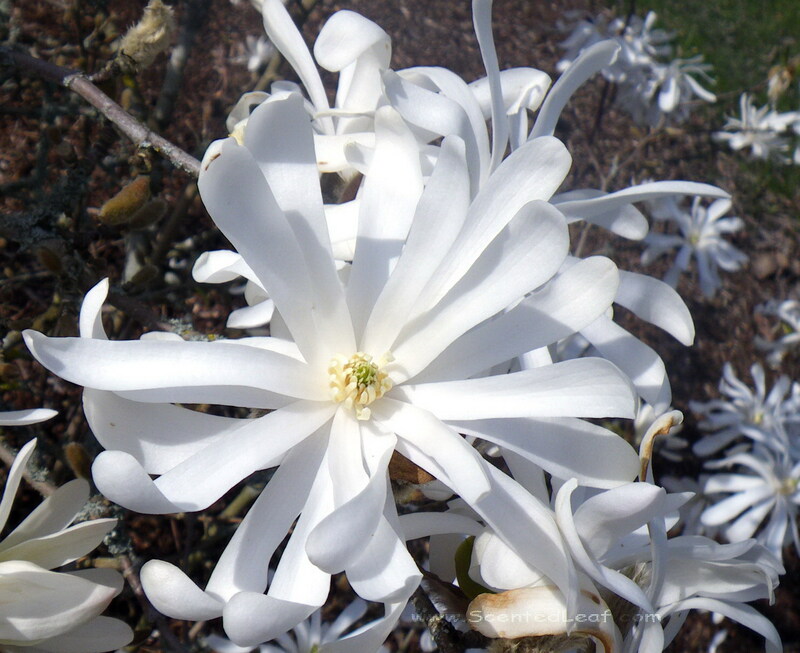 What a delightful sight to behold these spotless petals while unfold their curls to the sun! 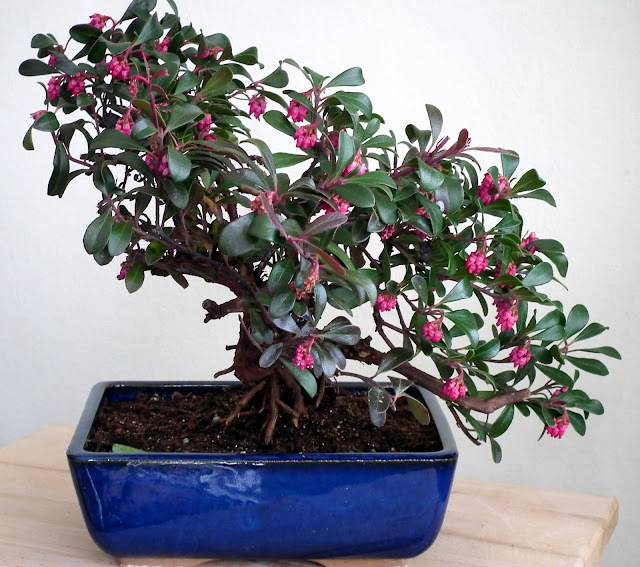 We felt in love with a "Vancouver Jade" plant few winters before... when we've found it to a Home Depot garden, scattering red through its green foliage covered by snow. It was a dense bush with interesting shape of the trunk, having around 20 cm tall and 30 cm wide. 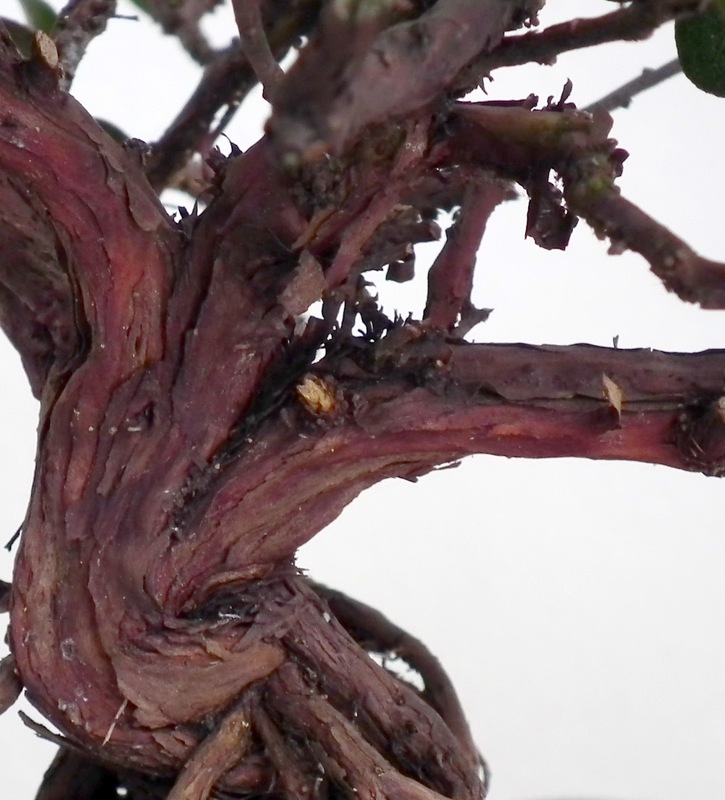 Turn it to bonsai next spring, after the flowering season has passed, was just another challenging project to us. 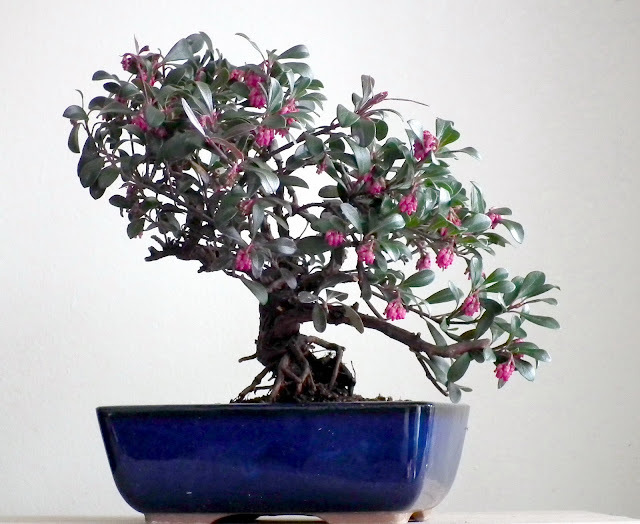 Uva Ursi edible Bonsai - The blue pot match the red berries and the pink flowers. Vancouver Jade was obtained in 1974 by University of British Columbia Botanical Garden (was selected by Mr. E.H. Lohbrunner in Victoria, British Columbia). 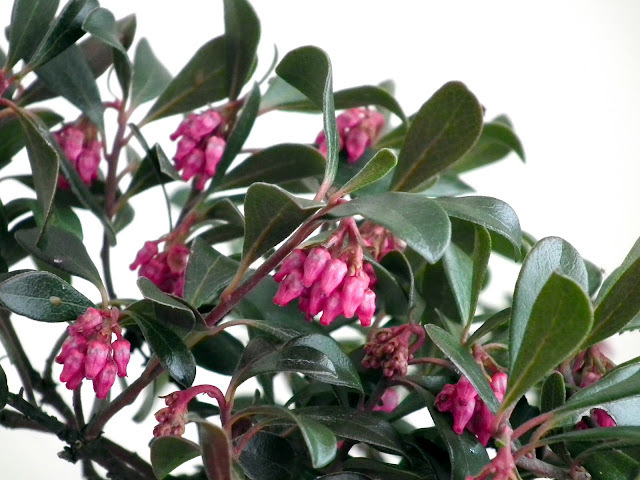 It is a very popular cultivar in British Columbia, with a vigorous growing habit which is spreading more quickly than the typical forms of bear-berries existing in the wild. You may find them as ground-cover in rocky garden-landscapes, covering cement walls or boulders, even in vertical gardens; and wherever you'll notice them, in any season, along Vancouver's walkways, Parks and Botanical Gardens, you'll be impressed by their lush foliage and the brilliant colors and fragrance of the flowers and berries. It has woody stems with patched bark, which root easily along the ground, helping it to widespread to rockery. Although the foliage looks very similar to cotoneaster's foliage, and is clambering with same rapidity over rocks and berms, do not confuse them. In spring the branches are covered by pink bell-shaped flowers which turn later in showy red berries, edible, but with a sandy-mealy taste and not so pleasant flavor (sometimes it is called also mealberry). Like almost any other berry, may be eaten fresh, dried or cooked - I tried them in all stages ;-), but in a small quantity to avoid stomach problems. 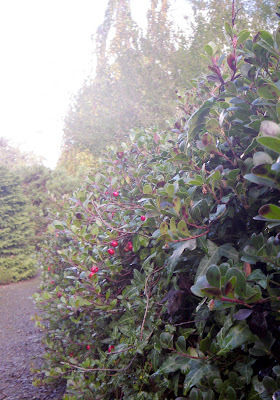 The dark green leaves which turning to redish in winter, are considered an ancient remedy to treat urinary problems. 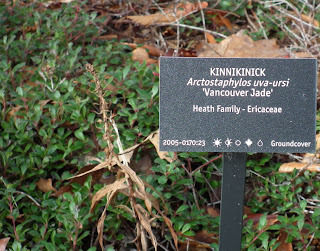 The kinnikinnick name was given because their glossy leaves mixed with tobacco and other aromatic herbs were used in rituals by First Nations. Dried leaves, tincture, essential oil or powder preparations are commercially available, being used nowadays in aromatherapy and herbal medicine. The "Magic and Medicine of Plants" book published by Reader's Digest in 1986 mentions: "In Traditional Herbal Medicine, however, it is not the berries but the leaves that have held the place of honor. (The berries, while nourishing, are mealy and bland.) Picked in the fall, the leaves were heat-dried for medicinal teas, which folk healers have used for centuries as a tonic and Diuretic in many parts of the world. The Chayenne Indians drank the tea for back sprains, and others used it to treat venereal diseases. Indians and colonists also mixed the dried leaves with tobacco. 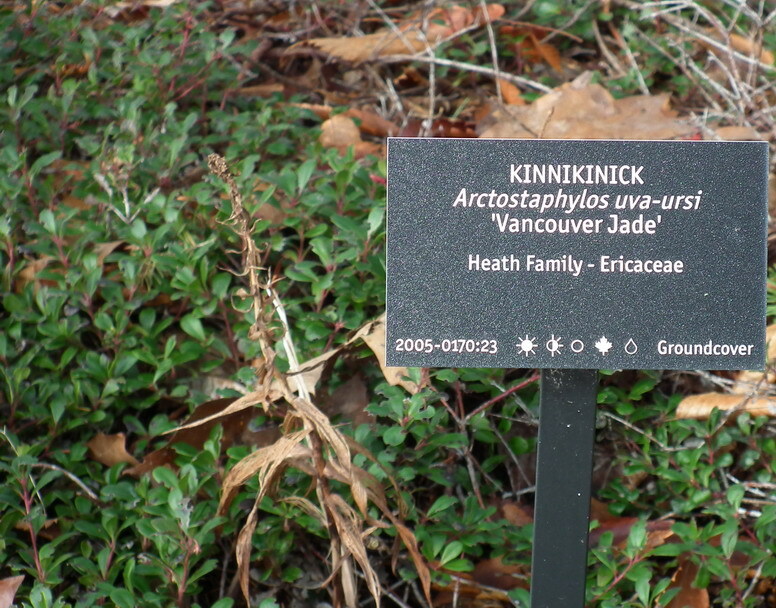 (the Algonquian name kinnikinnick means "mixture."" Don't you think that our Kinnikinnick Uva-Ursi Bonsai looks lovely with its dainty pinkish clusters of flowers? 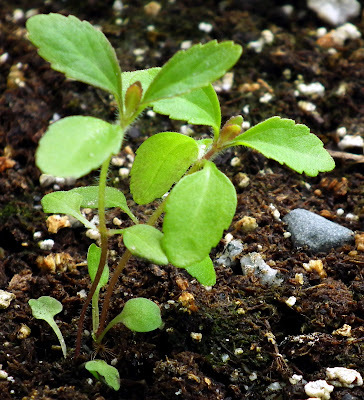 Stevia Rebaudiana is a plant used to sweeten drinks, cookies and other baked goods. It is also known as Ka'a he'ê, Sweetleaf, Sweet Leaf, Sugarleaf, Sweet herb of Paraguay, Caa-ehe, Honey leaf or Yerba Dulce and can be used in almost any way that ordinary table sugar or other sweetener are used. We included stevia leaves and powder as natural sweetener in our teas (for better flavor add just before drinking it) last year and believe me, we were impressed by its taste. Also we love to sprinkle stevia powder on top of fresh cut fruits: grapefruits, pears and strawberries. It is a real delight to enrich any herbal herbal tea with scented lemon-rose pelargonium leaves and sweetened with stevia dried leaves. 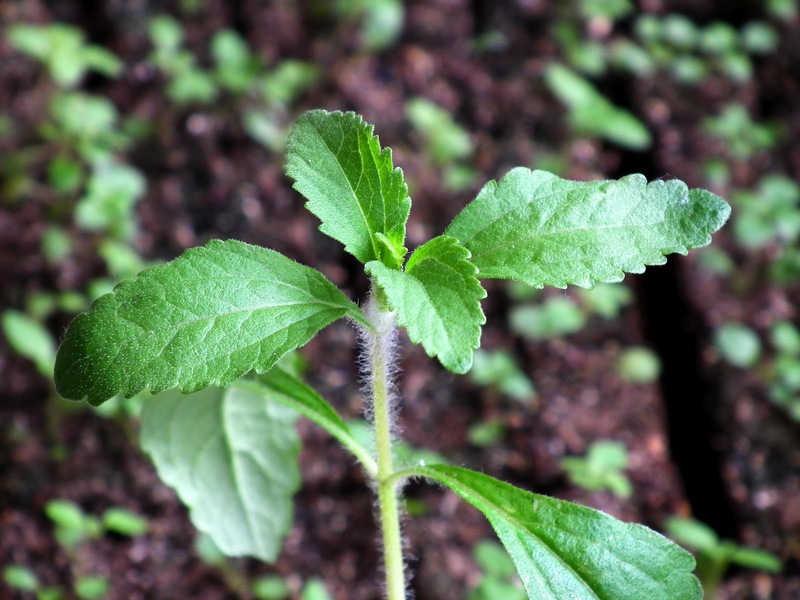 Stevia leaves can be used fresh or dried, like any other aromatic herbs. We've read long time ago about Stevia Rebaudiana higher level of sweetens (30-45 times) than ordinary sugar cane and about its long usage by Guarani people (for more than 1500 years) as natural sweet delight and safe medicinal herb. 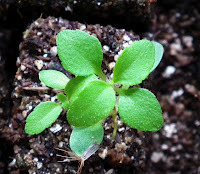 In Canada, Stevia Rebaudiana is available just as a dietary supplement and for personal culinary use (http://www.hc-sc.gc.ca/fn-an/securit/addit/sweeten-edulcor/stevia-faq-eng.php ) although in Japan, China, Korea, Thailand, South America, Russia and recently in European Union (December 2011) is cultivated and used as food additive (sweetener), too. There are a lot of information available online about its usage as a calorie-free sweetener in weight-loss therapy and treatment for people suffering from diabetes, hypoglycemia, and high blood pressure because has no carbohydrates. There are also a lot of products available in stores which contain stevia extracts like Truvia (by Cargill Ltd. ) and PureVia (by Merisant Worldwide Inc.). You know that something big is coming when brands like Coca-Cola, Pepsi, Danone, planning to introduce products using stevia sweetener - you may read more on Globe and Mail website - an interesting article published 3 years ago: Stevia is sweet – but is it safe? Well, important is that we really like the taste of stevia leaves, which is bitter and different flavored from the common sugar. 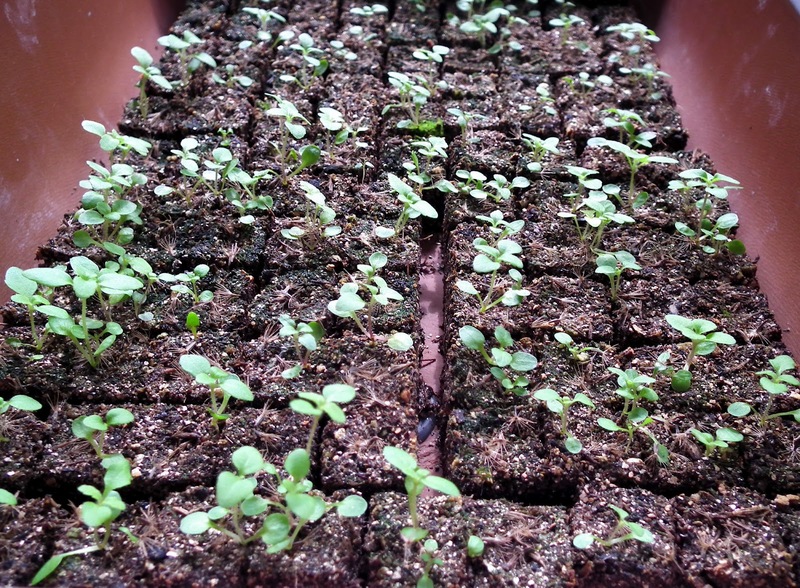 So, we decided to grow our own Stevia Rebaudiana plants, from seeds. - keep them indoor under fluorescent light 14-16 hours per day. - wait for 5-10 days before uncover the plastic tray, to allow all viable seeds to germinate. 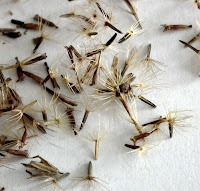 - water them moderately from bottom and spray the seedlings with chamomile tea to avoid dump-off. Is said that the seeds have low germination rate and we sowed few seeds in small soil-cubes - our favorite method to start seeds for this winter :). 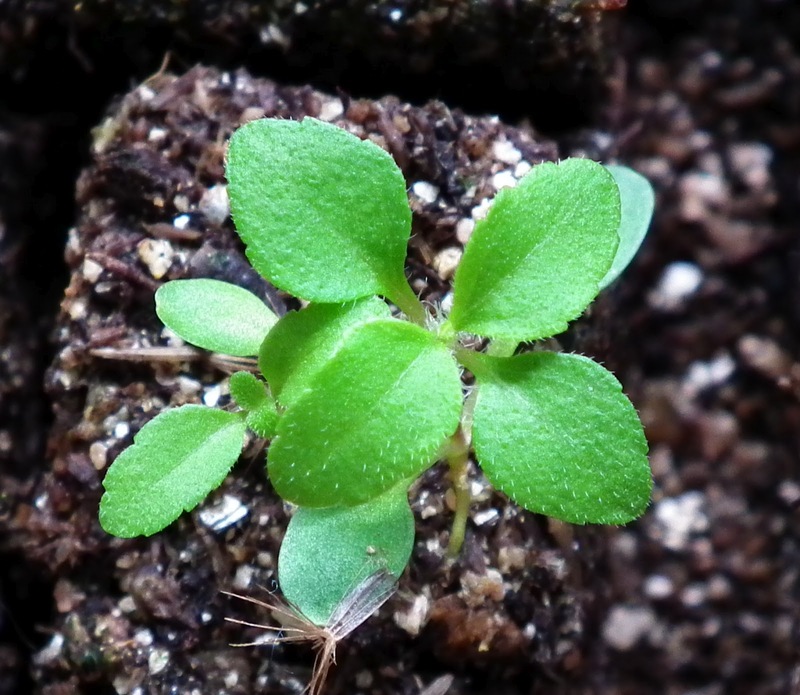 Similar with scentedleaf pelargoniums, Stevia is a perennial plant that can be pinch it out to make it bushier and cut down to prepare for overwintering indoor. Very important is that any time when you prune it, you may use the trimmings, although the best time to harvest stevia leaves is when the plants started to bloom. 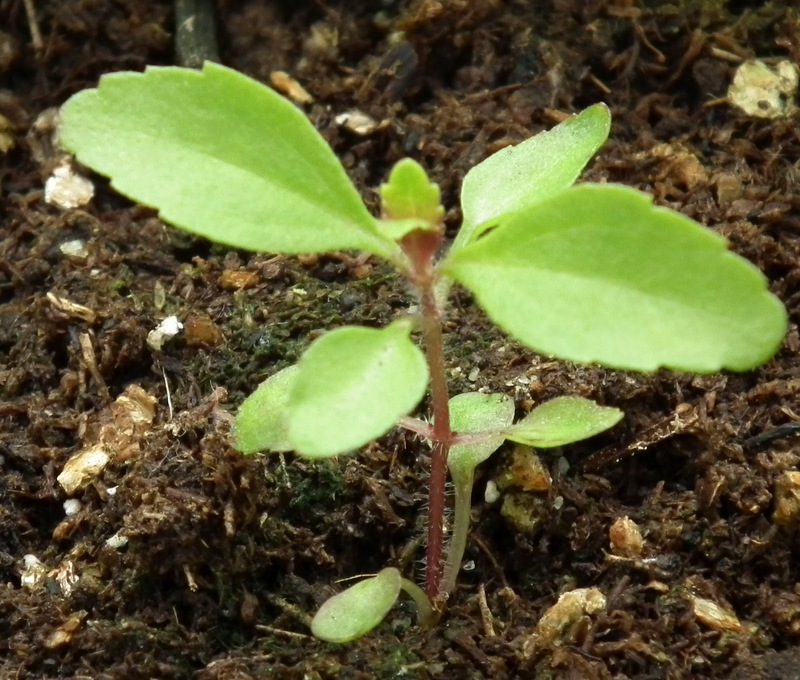 A month after we sow the seeds and the second set of leaves appeared, we replanted the seedlings outside, on rows, in a raised bed having 4 inches high and one feet wide. 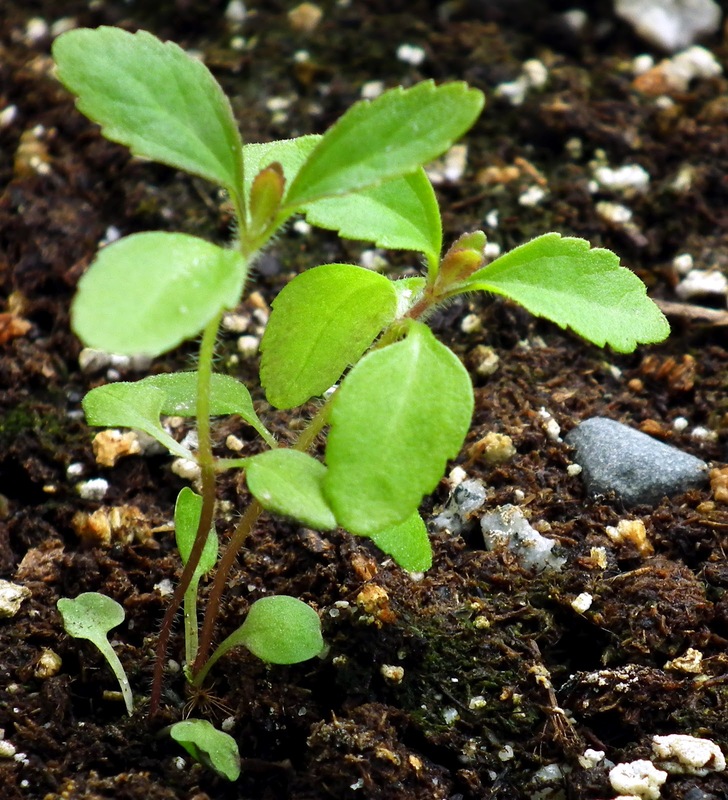 We maintain the soil moist (In Vancouver it is a somehow difficult task to avoid overwatering) and we are amazed that after a full-week of sun exposure, the plant stems and new buds started to have a reddish color. As we told with various occasions, we consider the returning to ancient knowledge about plants the best way to improve our life and we like to find natural alternatives to many chemicals used nowadays in processing foods and medicines. 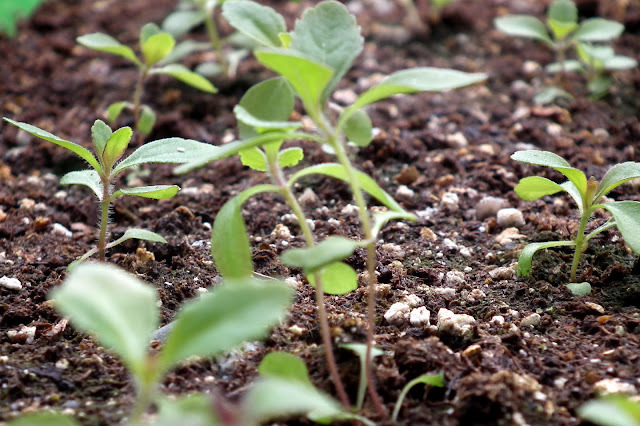 Growing our own Stevia sweet-leaves is just another safe step to improve the taste and quality of our food. and the light of smiles on my children's faces. Filling my mind with serenity and willing to share hapiness those whom I care. With a basket full of colored eggs, chocolate and fun. 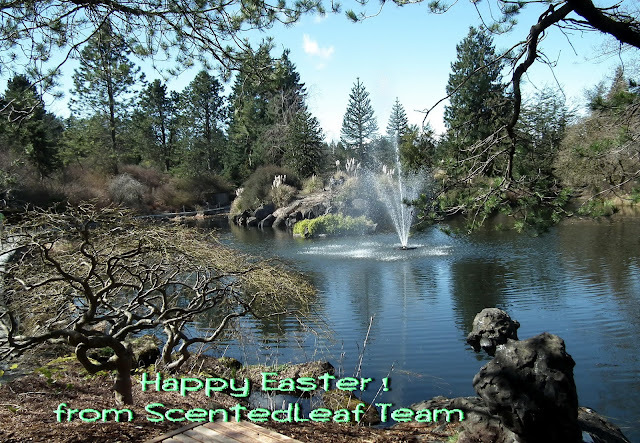 Hope everyone has all set ready to celebrate Easter 2012 with families and my Easter Poem will bring a joyful moment to your Easter Day. From ScentedLeaf Team: May all of you be blessed with peace and hapiness.